After you've done some baking, and you're cleaning up, remember to keep your eggshells, because they can be useful in your garden. You can crush them up (putting them in a bag first works well) and then spread them around plants to protect them from slugs and snails. The rough edges are too sharp for the slimy creatures to traverse, thus creating a barrier around your plant. 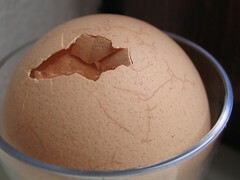 Over time, the eggshells will break down, so they won't harm your garden. Also good fun in crafts, stuck down and painted! By Charndra, at 12/16/2008 3:48 a.m.
By Green Living Eco Friendly, at 1/31/2010 10:45 a.m.
as they break down they fertilize. By Irine, at 9/27/2010 8:32 p.m.